Additional information not covered below can also be found in the 'FAQs / Help' section accessed via the tabs above. There were concerns about where these subjects fitted into the demands of the curriculum and discussions on how ‘Prevent’ could be covered within safeguarding frameworks. Some schools felt that related issues such as diversity, citizenship and discussion of events occurring nationally and globally were already covered particularly within the PHSE/SEAL/ECM agendas and a few felt that’ Prevent’ was not for them. The ‘Lancashire Prevent in Education’ group was formed from relevant partners. This group included partners from Lancashire Constabulary, Lancashire County Council, Blackpool Council, Blackburn with Darwen Council together with FE and other representatives. At the outset, the group was assisted by a number of volunteer schools who offered to support this work and look at the issues involved locally. A number of resources were developed by Lancashire Constabulary, partners and providers. These resources were trialled by some of the ‘Champion Schools’. Other Counties showed interest in the work and the products were initially launched across the North West in a hard copy resource folder, with DVD’s inside. A review of the resources highlighted that these original packs which remain available, were not universally accessible for all schools. In consequence, it was decided to re-produce the materials online and establish what materials schools including those Primary, HE and FE establishments would like to see. This activity resulted in the original Prevent for Schools (P4S) website being launched in July 2012, initially with a Key Stage 3/4 focus. Further progression quickly identified the absence of quality Primary-focussed resources which were subsequently developed by Lancashire colleagues and launched in May 2013*. Since this time, the P4S site has seen a steady growth across the resources with materials being used across the NW region by both Primary and Secondary colleagues. In 2014, a significant rise in traffic to the site from across the UK was seen and the popularity of P4S has continued to grow since. In 2015, further to the requirements of Section 29 of the Counter-Terrorism and Security Act 2015, the Government revised the Prevent Duty, outlining the statutory duties placed on a variety of specified authorities (including Schools) and re-iterating the three strategic objectives of Prevent originally outlined in the 2011 iteration. Further details of the Prevent Duty 2015 can be found via the 'Useful Information' section on P4S. 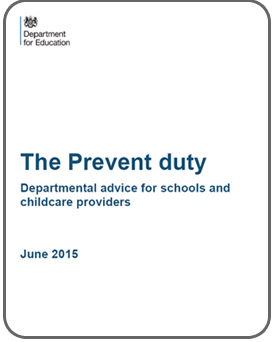 Further information on the DfE Departmental Advice is available via the 'Useful Information' section of P4S. Whilst continuing to prove immensely popular, the P4S site was identified to be refreshed in order to maintain currency and reflect the changing landscape of extremism and radicalisation. With the support of district colleagues across the Lancashire region, this work was undertaken in early 2016 resulting in the current iteration. In reviewing the content, it was essential to retain as much of the original material as possible whilst updating the advice and guidance sections to reflect recent updates for school-based colleagues. * It should be noted that publications referenced on this website may have been published by previous Governments and might therefore not reflect the current policy and guidance. For more information please refer to the Prevent Strategy 2011. 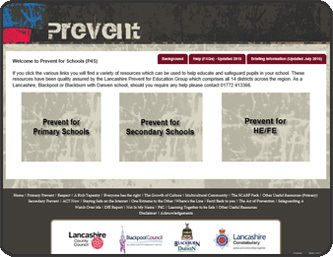 A ‘Lancashire Prevent in Education’ group was formed from relevant partners. This group was initially led by Lancashire Constabulary but is now led by representatives from Lancashire County Council, with partners from Blackpool, Blackburn with Darwen and the Constabulary, together with FE and other representatives. At the outset, the group was assisted by some willing schools who offered to support this work and look at the issues involved locally. Since that time, a number of resources have been developed by Lancashire Constabulary, partners and providers. These have been trialled by some of the ‘Champion Schools’. Other Counties showed interest in the work and the products were initially launched across the North West in a hard copy resource folder, with DVD’s inside. A review of the resources highlighted that these original packs which are still available, were not universally accessible for all schools. In consequence, it was decided to re-produce all the materials on line and then see what our materials schools including those primary, HE and FE establishments would like to see. The core working group have also discussed other sensitive issues where teachers have indicated they may benefit from ‘approved‘ resources as a starting point for safe discussion.